Review by AllTheBestFights.com: 2019-02-02, great fight between Ted Cheeseman and Sergio Garcia: it is close to get four stars! Both undefeated, the EBU European super-Ww champion Sergio Garcia entered this fight with a perfect boxing record of 28-0-0 (13 knockouts) and he is ranked as the No.11 super welterweight in the world while his opponent, Ted Cheeseman, has a record of 15-0-0 (9 knockouts) and he entered as the No.13 in the same weight class. In their last three fights Garcia has beat Jeffrey Rosales, Giorgi Kerdikoshvili and Maxime Beaussire (Sergio Garcia vs Maxime Beaussire) while Cheeseman has won over Carson Jones (Carson Jones vs Ted Cheeseman), Paul Upton and Asinia Byfield. 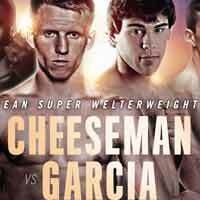 Cheeseman vs Garcia is valid for the EBU European super welterweight title. Watch the video and rate this fight!